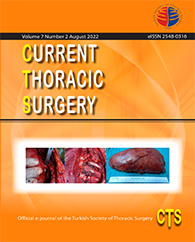 4Department of Otolaryngology, Istinye University Health Sciences Faculty, Istanbul, Turkey DOI : 10.26663/cts.2018.0001 Viewed : 1072 - Downloaded : 372 Background: Mediastinal lymphadenopathy (MLAP) is observed in various conditions of malignant or benign diseases. The two common diseases leading to MLAP are mediastinal lymphomas and sarcoidosis. The aim of study is to describe distinctive lymph node involvement patterns with sarcoidosis and lymphoma defined by PET-CT.
Materials and Methods: 82 patients (45 women and 37 men) with a median age of 53.5 (21-88) years who had PET-CT for differential diagnose for MLAP were evaluated retrospectively. 31 (37.8%) patients diagnosed sarcoidosis, and 51 (62.2%) lymphoma that had histologically proven by various surgical procedures. Results: There were no statistical difference between gender, age and average SUV max of groups (p = 0.068, p = 0.846, p = 0.338). 26 of 31 patient (83.9%) of sarcoidosis group had abnormal findings compared the lymphoma group (51.0%) which showed statistically significant difference (p = 0.003). Meanwhile there were no statistical difference between hilar lymph nodes and liver involvement among the groups (p = 0.239 and p = 0.917), cervical, axillary, abdominal lymph nodes and spleen involvement was significantly higher in the lymphoma group (p = 0.008, p < 0.001, p < 0.001 and p = 0.001). Bone marrow (BM) involvement were also significantly higher in lymphoma group (p < 0.001).